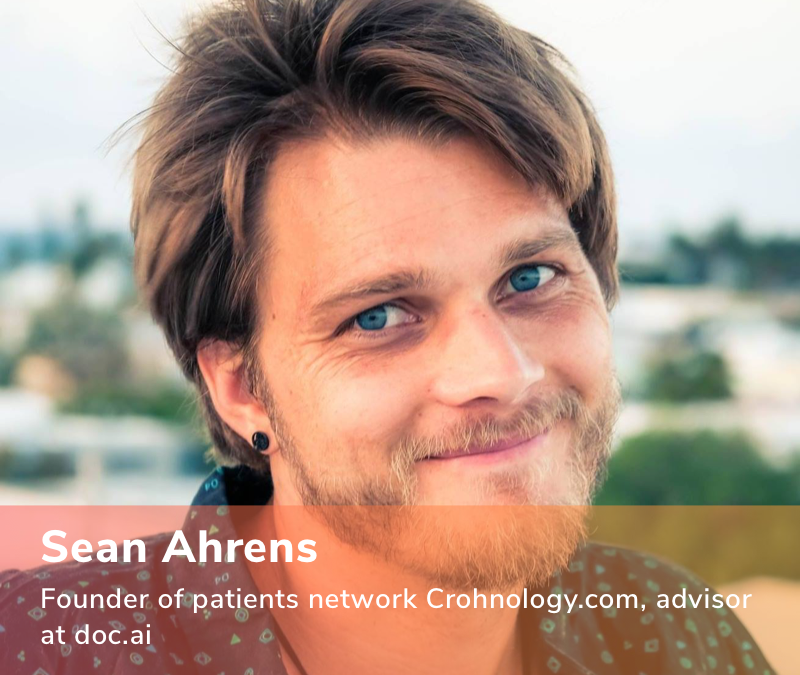 We are publishing an interview with Sean Ahrens, founder of Crohnology.com, a patient-to-patient information sharing network for people with chronic medical conditions. We collaborate together on our newest data trial to predict the most optimal supplement for Crohn's and Colitis. Leveraging the data trial with his network of more than 12,000 members with Crohn's & Colitis, we aim to build machine learning models to help people find the most effective supplement for them, build a more precise picture of their health, and accelerate medical research at large. Hi, Sean, tell us about yourself and what you are doing with doc.ai? Hi, thank you. It’s a pleasure. I teamed up with doc.ai to help put their technology to use in studying Crohn's & Colitis (IBD) from the volunteered real-world data of patients daily lives. I have Crohn's myself. It’s a difficult, poorly understood disease, for which the success of treatments in a given patient is a dice roll. I believe we can accelerate finding the cure by learning from where patients’ lived experiences differ from the disease model currently understood by medical science. I believe technology is capable of radically changing how we do medical research, enabling us to learn from the real-world experiences of patients like never before. Because of my currently incurable health condition, Crohn's, I'm obsessively focused on designing digital products that empower patients to contribute to research on curing and treating their disease. The professional title I have for myself is “patient-focused digital health technologist”. I design features and user experience and often also structure and code technology as well. I'm working with Sam, Chethan, Dr. Challa, and the data science team at doc.ai to help shape the product to both best meet the user experience (UX) needs of patients and gather the right data from patients so that valuable research findings can be made. What experience brought you to doc.ai? In 2010, at the beginning of the digital health wave, I coded up the website Crohnology.com: essentially a social network of patients with Crohn's & Colitis that consists of integrated health tracking tools so that patients can monitor and contribute their real-time health information (symptoms, treatments, supplements, and diet) to a central database that all patients can learn from. These diseases, Crohn’s & Colitis, have a significant impact on people's lives; they cause debilitating inflammation in the gut. Medical science doesn’t fully understand how these diseases work, so treatments don’t work well for everybody. A lot of patients find real-world relief with diet, supplements, and modifying their gut microbiome, but their experiences are found in web forums, not in medical literature. Because a lot of these treatments can't be patented by drug companies, they are almost not studied at all. Crohnology arms patients with the tools to track their own health, effectively doing their own studies, and to share that information directly back with other patients. Crohnology currently consists of over 12,000 patients with Crohn's & Colitis. I've built various other patient-powered technologies. One of these is OpenPPRN, The Open-Source Patient-Powered Research Network, which is designed as community technology for any group looking to build their own health-tracking patient community. Another is PatientPowered.us (patientpowered.us), which is a mobile website & app I wrote to enable researcher and patient to collaborate around study ideas. This software took the first place grand prize in a PCORI (The Patient-Centered Outcomes Research Institute) app development challenge. I currently lead the UX and technology design of UNC's IBD Partners, a multi-million dollar grant-funded project sponsored by PCORI and CCF (The Crohn's and Colitis Foundation), seated at the University of North Carolina. IBDPartners is a network of patients who propose and vote on study ideas, and who contribute data from their day-to-day life with their condition. Researchers review the ideas and turn them into patient-centered research studies. In 2016, I was published in the American Journal of Gastroenterology with a short paper I wrote called "Opening (and Swallowing) a Can of Worms to Treat My Crohn's Disease" , detailing my N-of-1 trial self-administering helminthic therapy (parasitic intestinal worms). I joined doc.ai when I learned about the technology they were building and saw that if we collaborated, we could apply this technology to study my condition, Crohn’s–and it’s sister, Ulcerative Colitis. What does the doc.ai app do for people with Crohn's & Colitis? To start off with, the base doc.ai app is a personal health tracker that enables users to keep a daily log of their health (eg. disease activity). But beyond that, doc.ai takes in a range of factors around them: their environmental air quality, their age, health history, and more. But what we are doing in Crohn's & Colitis is special. Throughout my experience, I’ve often asked patients what they would like to have studied, and one of the popular recurring responses was to research the effect of dietary supplements. The intake of supplements and modification of diet is something that a lot of patients do, but we have little evidence or studies behind what works. Intuitively, if you think about it, for a disease whose major symptom is inflammation of the digestive system, this is very strange. This almost makes you imagine the possibility that there exists an invisible hand of monied interests affecting what gets studied and what doesn't. So with the help of Dr. Challa, gastroenterologist at Kansas Medical Center, we designed a purpose-built version of the doc.ai app for Crohn's & Colitis and decided a “data trial” to specifically do one thing: to try to scientifically identify supplements that quell (or exacerbate) disease activity. Participants will receive free kits from uBiome to analyze their intestinal gut flora (the colony of bacteria living in their gut) for use at two different time points of the trial. Over three months, patients will record the supplements they take and the symptoms of their disease activity. The data scientists at doc.ai will analyze the data as it comes in and finally when the trial is complete, and publish their findings for all to learn from. The important thing I’d like to emphasize is that patients have control over the data they share with doc.ai: patients decide if, when, why, and with whom their data is shared. Why is this important to you, and where do you see things going from here? This is so very important to me because there are tens of millions of people living with Crohn's & Colitis around the world right now as I speak. A substantial portion of these are people who are seriously suffering medically and/or financially from these conditions. From what I've seen in thousands of patient experiences (including my own), diet and supplements affect these diseases. Importantly, this observation runs contrary to the existing medical understanding of these conditions. This tells me that the existing medical model of these diseases is incomplete or inaccurate. It’s a bit like when astrophysicists observed that the universe did not behave in a way their models could explain, they discovered the existence of dark matter. Similarly, I believe there is another force at play in these diseases which is yet to be discovered. And I believe that this discovery will be found somewhere in the gut microbiome. If we more quickly turn our heads to this inconsistency–this revealed flaw in the disease model– we will more quickly discover the true nature of these diseases. This could lead us to discover the cure to them in the next decade, instead of the next several decades. By moving up this timeline for a cure, we will have saved tens of thousands of lives and improved the lives of tens of millions of others. This is why this work is important to me.